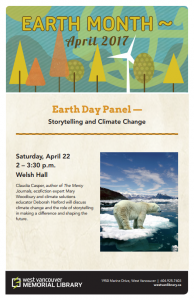 On April 22, celebrate Earth Day with a panel discussion on the importance of storytelling when it comes to climate change. Join ACT Executive Director Deb Harford, author Claudia Casper ,and ecofiction expert Mary Woodbury to discuss the role of storytelling in making a difference and shaping the future. When it comes to climate change, storytelling is key to help people visualize how a low-carbon future could improve resilience, adaptability, and community connections.